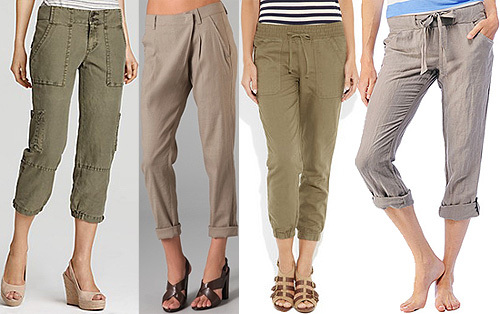 Cropped Linen Pants Make For a Casual Yet Sophisticated Summer Look! No matter how hot the summer days get, believe it or not, you don’t have to resort to the shortest skirt, skimpiest shorts, or loosest, flowy maxidresses you can find just to avoid sweating your tush off! Choosing the right breathable material can make the world of difference when it comes to staying cool, and comfort is key! Cropped linen pants have the right idea, as they’re thin but not shapeless, and have just the right amount of roominess while still maintaining that slim, tailored look. Go super-casual without verging on sloppy with a pretty pair of metallic sandals, or pick a work-appropriate slack-inspired pair to wear with your most sensible heels. Even though they’re meant to be worn effortlessly, it’s important to be mindful of length; cropped and rolled pants can be tricky if you weren’t blessed with supermodel gams, so be sure to pick a pair that’s comfy and flattering! Plus, you can always rely on some platform espadrilles to elongate legs! From left to right: Quotation: Sanctuary “Getaway” Linen Pants, Vince Asymmetrical Linen Pants, J. Crew Kirsten Linen-Blend Pants, and Splendid Woven Linen Cropped Pant.